Model PPVL8558 incorporates a bolted Ø500mm (Ø195/8”) manhole with a Ø254mm (Ø10”) PAF 7545 pressure relief valve (PRV) and a 6866AL normal vent. The manhole has an industry standard 24-hole bolt pattern sized for M8 bolts. The cover has provisions for a threaded style vapor recovery vent, overfill protection sensor and dip tube. The cover has a minimum 12% elongation. The emergency pressure relief valve opens to relieve excess pressure within the tank compartment and closes when the excess pressure has been relieved. See technical specification chart below for cracking pressure and flow capacities. 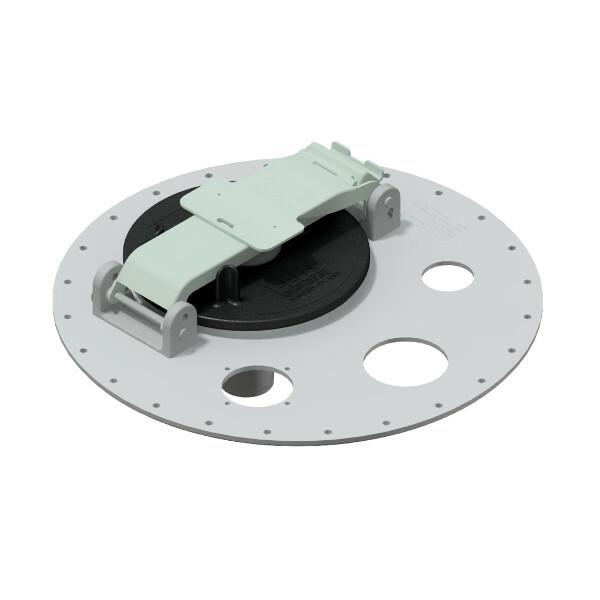 The pressure relief valve also serves as a quick open inspection hatch that incorporates a secondary safety catch that enables internal pressure to escape prior to the latch being fully released.